From the first crisp morning and the first leaves that change colors to the first night you need to put an extra blanket on the bed, signs of fall beckon us to spend more time indoors. Satisfy your urge to nest while sparing your wallet with these 10 easy, elegant and, of course, cozy touches for every room. Whether you are looking for an instant change (toss a plaid blanket over your table) or something more permanent (install DIY shelving), here you’ll find inspiration to get your creative juices flowing. 1. Give an old quilt a new purpose. 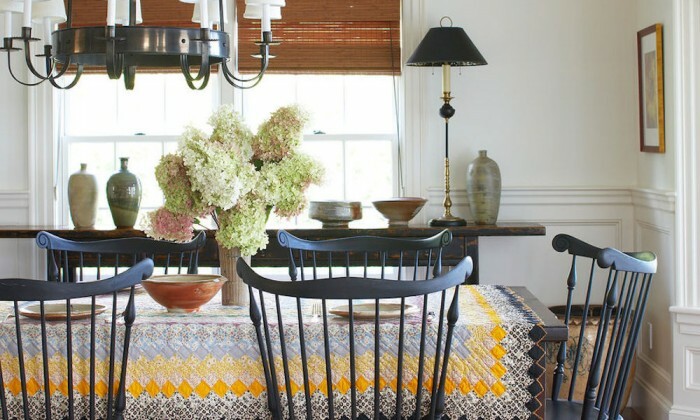 While you wouldn’t want to eat on Grandma’s priceless heirloom, vintage quilts picked up at thrift shops can make fabulous tablecloths. Spot clean it between uses and give it a full wash only when really necessary. 2. Craft DIY shelving. 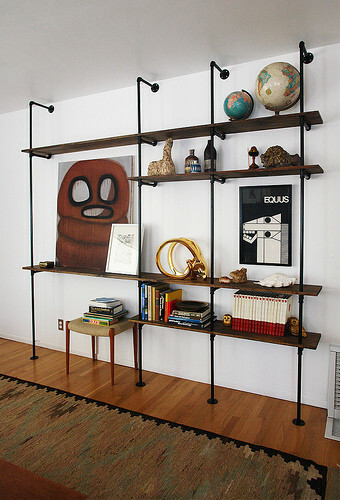 Why spend big bucks on a fancy industrial-style shelving unit when you can make your own with basic supplies from the hardware store? 3. Use a plaid blanket as a tablecloth. A small, round table is the perfect spot for showing off your favorite fall colors and textures in the form of a cozy blanket. Let the blanket drape to the floor—imperfect is what you are going for here. 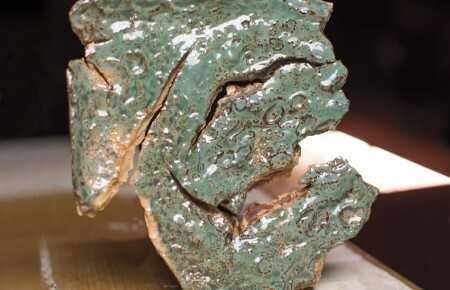 Top it with a cluster of small picture frames or place one large item, like an urn or a lamp, in the center. 4. Display fall gourds the elegant way. Want to try something different from the usual piles of pumpkins this year? Pick up at least five or six big decorative gourds for an abundant display—look for the kind with elegant, swan-like necks—and line them up down the center of your dining table. What could be easier? 5. Scour fall flea markets for original art. Vintage portraits and landscapes from unknown artists are often affordable. Choose just one to spotlight, or collect art around a theme and make a gallery wall. 6. Paint your stairs a daring hue. Who says stairs have to be boring? If you have plain wooden stairs, especially if the wood is not in particularly good condition, consider painting them magenta, navy, mustard…or any color you love. 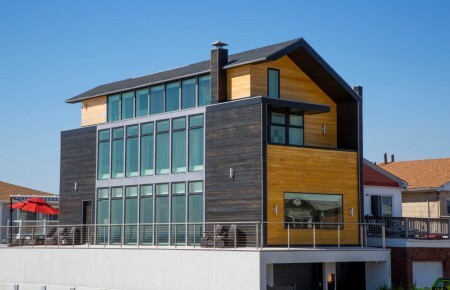 This is a bold look, so if you are feeling wary, try it on a back stairway or in a tight stairwell—not on the front-and-center entry stairs. 7. Use vintage textiles as upholstery. Although the sectional shown here was custom made, you can draw inspiration from this look to revamp your own sofa, chair or cushions with colorful vintage textiles, including rugs. If you’re DIY savvy, you could attempt to re-cover cushions or upholstery yourself, make cozy pillow covers or simply wrap seat cushions in textiles for a temporary change. If you want to use vintage rugs on your furniture, have them professionally cleaned first. Or you can carefully clean vintage textiles yourself by gently agitating them by hand in a bathtub of lukewarm water with a mild soap. Rinse and air-dry them before using. 8. Get beautifully organized. Bring a touch of glamour to your morning routine by setting the items you use daily atop pretty trays. There’s no need to buy new trays—just peek into your kitchen cabinet or china hutch, and grab a few pieces you haven’t used in a while. If you really want to go the extra mile, scoop up a few little glass containers at the craft store and decant your favorite toiletries. 9. Style your kitchen. 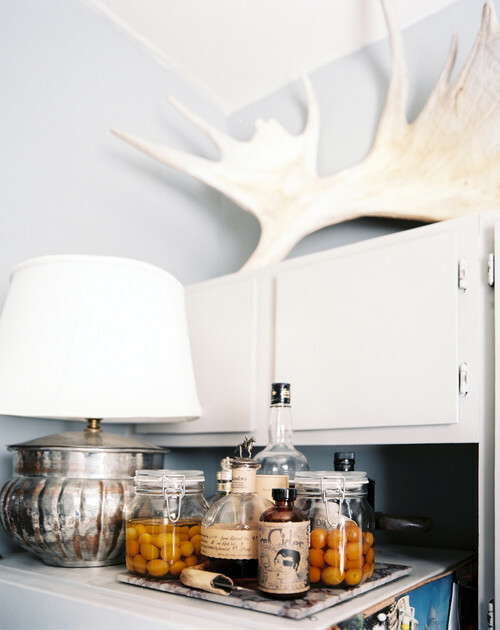 Corral jars of pretty preserves and artisanal cocktail makings on a tray, bring in a real table lamp for a soft glow, and put something sculptural and a little unexpected (like the antler shown here) atop a high shelf. We tend to cook and congregate more in the kitchen during the fall and winter, so why not make it a place that feels just as warm and cozy as the rest of your house? 10. Paint your front door. It’s the first thing you see when you come home each day—why not make it gorgeous? A few coats of a rich hue that complements the color of your siding, plus a shiny new door knocker, can completely transform the front of your house for less than 50 bucks. Tell us: What is your favorite budget-friendly way to decorate for fall?